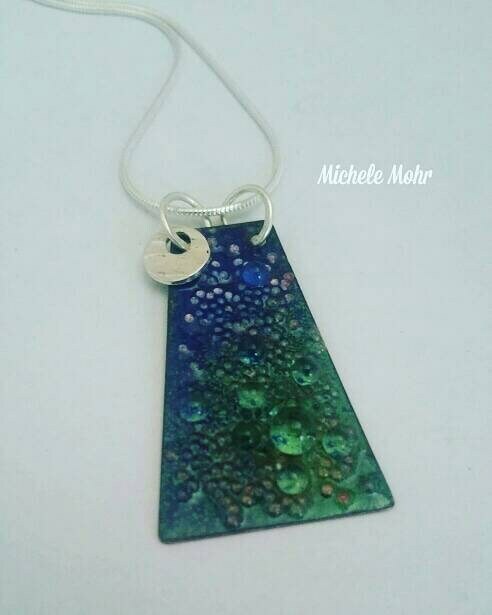 Created from copper, vitreous enamel (powdered glass ) and sterling silver. Enamel was sifted onto copper and fired in a kiln at approximately 1460° Farenheit. Glass was sifted and fired onto metal piece multiple times on each side. Glass beads were fired into the enamel to provide texture. The beads reflect the light and the beautiful colors. The piece was filed. A sterling silver disc was cut and hammered,.filed and attached with handcrafted sterling silver jump rings to a 20" adjustable sterling silver snake chain. Pendant is approximately 1.57" in length and 1.125" wide.